Don’t try this! 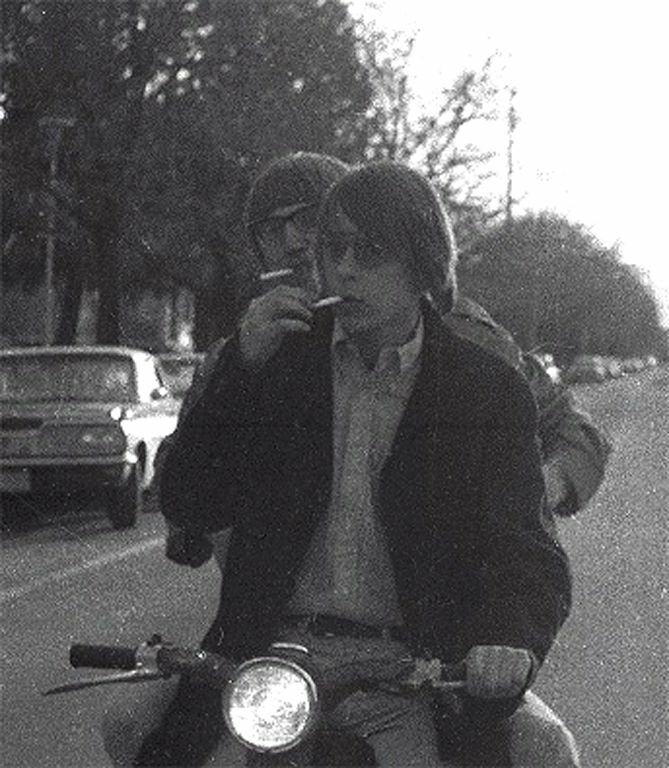 John Herman and I light up in Missoula, 1968. One of my alert readers asked about my encounters with dead people. I will not tell the tale by Jack Handey about the severed head of his friend Don, but those of you who want a real good short story can simply google “Jack Handey severed head” without the quotes. I said short, but I meant, like, three sentences long. Yes, the corpse fascinates me. You too. I would have you read Mary Roach’s book, “Stiff,” in which she delightfully explores the topic; although she subsequently admitted that she wished she had included “Operation Mincemeat” by Ben MacIntyre, the telling of how the allies tricked Hitler with false intelligence chained to the wrist of a planted and doctored corpse. Roach observed that human bodies are funny, as long as you have no relationship to the persons the bodies belonged to. Here are my encounters: my grandpa Carl T. Bonde in his open casket in 1958. I couldn’t believe it was him! He looked funny, somehow. Not funny. Odd. His head looked more rounded and perhaps his false teeth were out. I was only slightly less interested in the great number of old, bald, red-faced men who attended: old Norwegian and German men I had never seen before. My brother remarked on it. Some of my encounters, as you will see, were false, or demi-encounters. In high school I read a lot of stories about ghosts, necromancy, spiritualists, like that. One winter night in Dillon, Montana in 1964 I heard the squealing of metal-on-metal out my bedroom window on Atlantic Avenue. In those days wreckers towed with a hook, and although the driver had used some sort of dolly for the mangled car, it made a lot of racket. I watched, fascinated, as it passed. My friend Philip Davis and I delivered newspapers the next morning, just a few hours later, so he and I hiked out west of town to see if we could find any human body parts that had been left behind. Dillon is high-altitude, not so far from the continental divide and damned spooky in the winter, at night. Philip and I got the newspapers at the town police station where the dispatcher worked. The Butte-Anaconda Montana Standard, a union paper in those days, would be dropped off by a Greyhound bus at about 5:30. Philip and I folded the papers indoors there, where the other carriers sat around the periphery of the room. Philip’s route took us to the windy, cold highway where it entered town near Barrett Memorial Hospital and Western Montana College of Education. Of course it was still very dark because it was winter. Two years later, a bunch of us clustered around to stare at the car Johnny Quick crashed into a bridge abutment that killed him and Joe Bramsman. Their blood was all over the interior of the crunched up Chevy Bel-Aire. One of their shoes was in the back seat. This was the same car Johnny took me and Allen Lenhart to work in a previous summer. We had to help pay for gas for that souped-up engine. Johnny had modified the steering wheel. He had a so-called “suicide knob” and he had cut out a portion of the wheel so that it resembled the aileron control on an airplane. He put crutch tips on the raw ends of the “wheel.” Once on Atlantic Avenue when Johnny was taking me to my house one of the crutch tips caught Johnny’s rubber irrigation boot and we almost hit the front of a semi before he got it loose. In 1967, my grandma Ellen Bonde died in Dillon at 80. I don’t remember what she looked like afterward, but she looked ill before she died. We all went to Kalispell for her funeral and I remember seeing my aunts and abundance of cousins on my mother’s side. I think that was the last time I saw all four Judd boys together. Other than a severed leg that I’ve told about before, one in a box at the University of Montana, I didn’t see any bodies until 1969 when I worked on the crabbing boat in Seattle. I was painting a bulkhead when Larry Felton poked his head around a corner and wrinkled his nose. “What a disgusting sight,” he said. “What is?” I asked, dropping the wet brush into the bucket. There, just a few feet from our boat we saw a police boat that had officers fishing a body out of the lake. At first I thought they were picking up some styrofoam, but then I saw clothes and realized the corpse’s flesh had turned white from being submerged. “A stiff!” someone said. Came a long dry spell, dead person-wise. Especially when I hitch-hiked and rode freights. Time seemed so slow that it almost stopped. I physically encountered no bodies while I was in the Marines! One in my squadron took pills and drank and died in the night; so, being a supply man, I inventoried his belongings, packed them into boxes, and mailed them to his mother. Another died while I was in supply in California. A staff sergeant with a particularly foul mouth crashed his Corvette so I packed up his things too. In each case I followed protocol and common sense. I removed all of the pornographic magazines and any condoms and any flammables, like aftershave or cologne, or other stuff that would be messy, like laundry soap, or any liquor. Any illegal stuff would have been already confiscated by the police. Someone from our squadron escorted the bodies back to the Marines’ homes for burial with military honors. No stiffs for me until we moved to Billings and I began working in a hospital. I’d help doctors and nurses and emergency medical people try to revive a body perhaps every 2 weeks. At first I had nightmares and I was jumpy whenever I heard a siren in the distance. The sight of a perfectly good body—fine in every way, except for being dead—made me feel quite sad. In fact it still does. I worked five years at the hospital and of the more than 100 resuscitation attempts I witnessed, exactly two succeeded so that the revived person could return home. The scene typically, for a patient brought in by rescuers, would be that the patient was expertly taped with towels and white tape to a wooden board. Someone would have oxygen flowing through a mask that they would be squeezing to mimic breathing. Another person would be compressing the victim’s chest. The doctor would admire the taping and towels, say a few encouragements to those with the mask and compressions, then get an intravenous line placed. Then he would give just about every adrenergic drug in the crash cart, many syringes of sodium bicarbonate, then do it all again a few more times before calling it quits. I would dutifully write the time on a form. Now that I am retired I have encountered dead people mostly at funerals, frequently enough that I hardly bother to look at bodies in caskets any more. Oh, I look to make sure the person is really dead, but then I strike up a conversation somewhere. I guess I should finish the story of how Philip and I visited the site of a terrible automobile accident just west of Dillon before dawn in the winter. Remember, we were looking for any left over body parts. You are leaning forward, attentive. “The severed head,” I begin.